In the heart of downtown Pittsburgh, the Monongahela River from the south, and the Allegheny River from the north, join to form the Ohio. 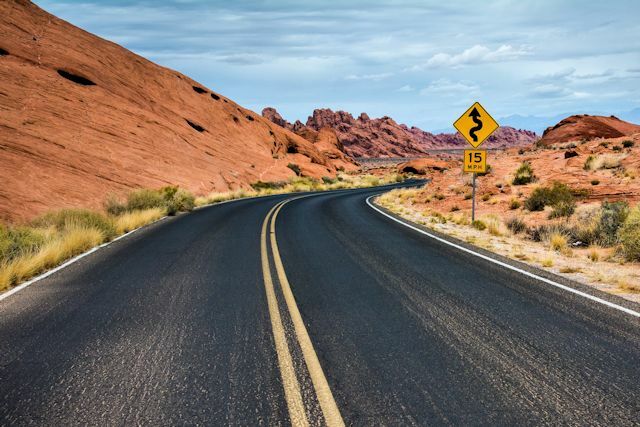 Many tributaries of these rivers cut through the city, making bridges a significant necessity. 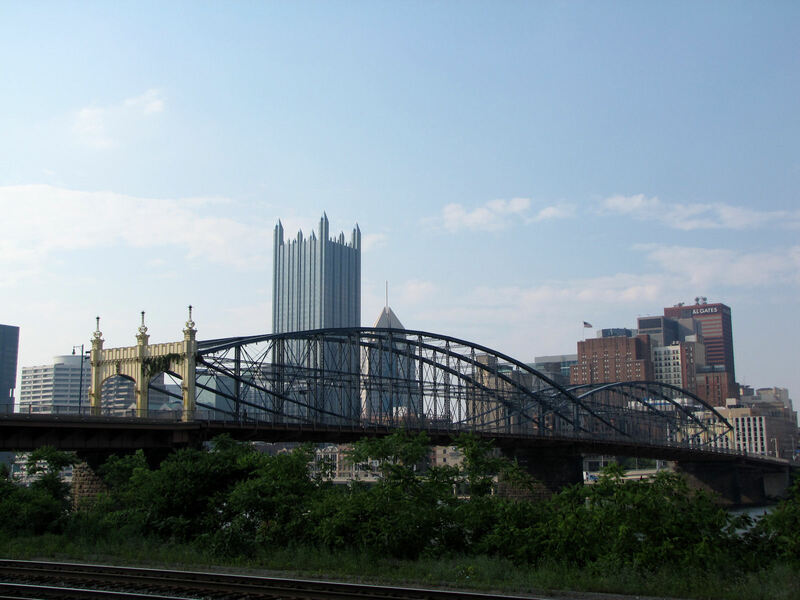 According to a 2006 study by a University of Pittsburgh visiting professor, there are 446 bridges in the city. To be counted, a bridge had to be within the city limits and had to have piers and a stand. 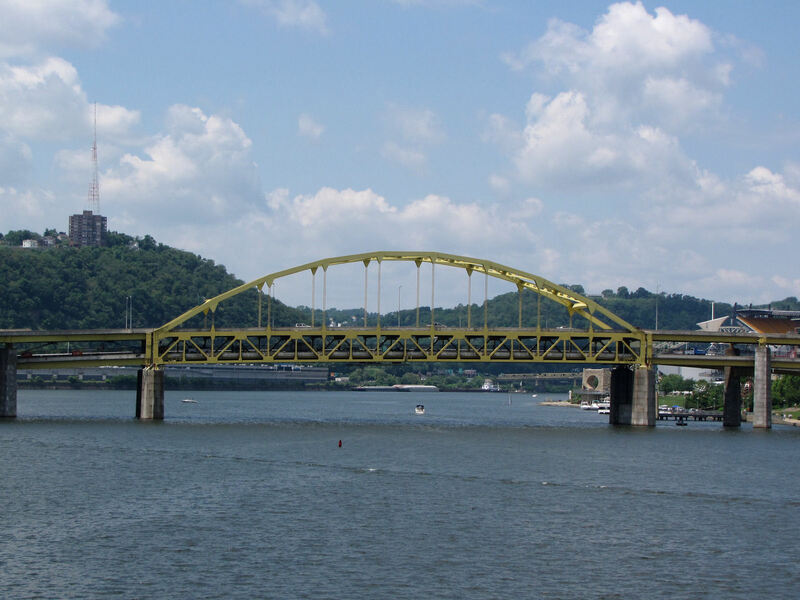 The Guinness record keepers accepted this count and officially named Pittsburgh the city with the most bridges, three more than runner-up Venice. About 40 bridges cross the three rivers, and we have spent the last couple of days visiting and photographing them, an engineering scavenger hunt. 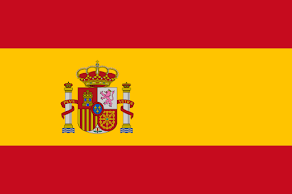 Most types of bridge designs-- including suspension, cantilever, arch, beam, girder, truss-- are represented, and most of the bridges were built from locally produced steel. Many of the bridges in the downtown area are painted golden yellow to match the city's official colors of black and gold. The Fort Pitt Bridge over the Monongahela River and the Fort Duquesne Bridge over the Allegheny River are on opposite sides of the city's "Point". These twin bridges are both double-decked carrying four lanes of northbound traffic on the upper deck and four southbound lanes on the lower deck. 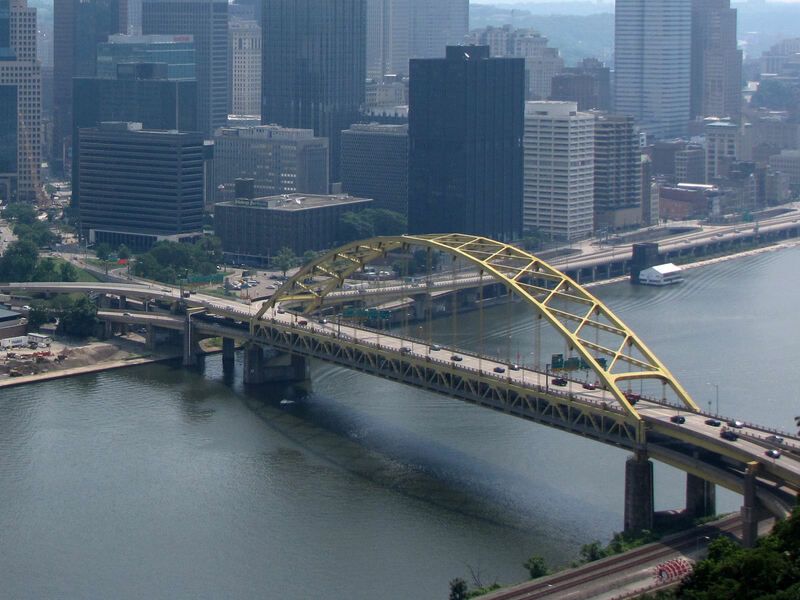 Like many Pittsburgh bridges, each has a pedestrian walkway on its lower deck. Built in the 1920's, the Three Sisters are three parallel, nearly identical self-anchored suspension bridges that cross the Allegheny River at 6th, 7th, and 9th streets. 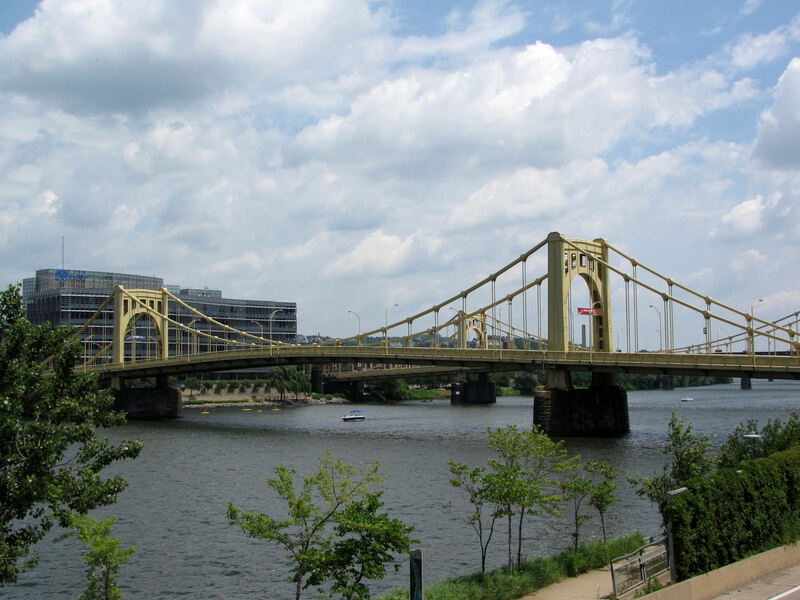 The bridges have been recently renamed for prominent Pittsburgh residents: Roberto Clemente, Andy Warhol, and Rachel Carson. Opened to traffic in 1883, the Smithfield Street bridge across the Monongahela is the city's oldest river bridge still in use and the oldest steel bridge in the U.S. Almost demolished for its inadequacies and deteriorated condition in the early 1990s, the bridge was saved and rehabilitated through the efforts of local preservationists. 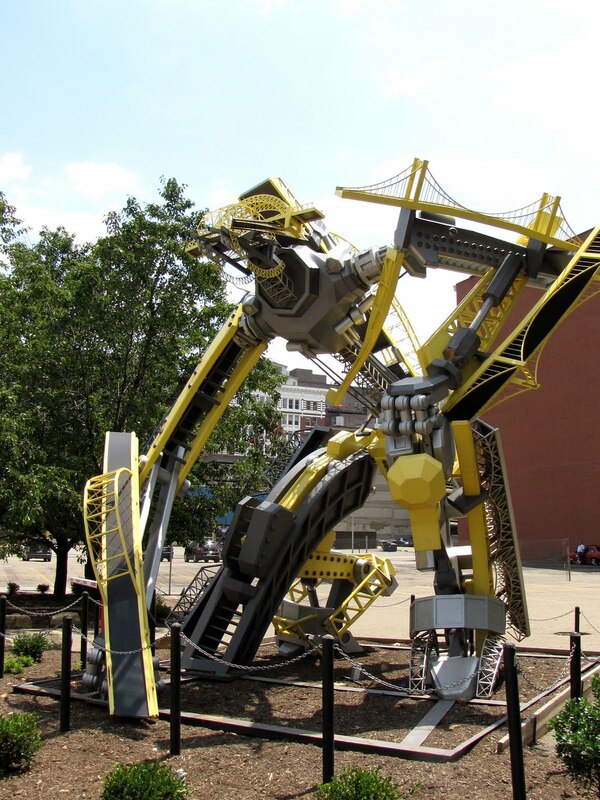 Commissioned by the City of Pittsburgh as part of the celebration of Pittsburgh’s 250th birthday, “Arch” is a 20-foot tall Transformer-type robot which embodies designs from many of Pittsburgh's most recognizable bridges. As protector and champion of the city, Arch stands vigil on a downtown street corner, looking out onto the rivers. The work of Los Angeles artist Glenn Kaino, the sculpture was originally slated to be on display for six months in 2008. Because he proved so popular with residents and visitors alike, Arch has lasted well beyond his expiration date. For any lover of bridges, Pittsburgh is a great place to visit. And, if you're like us, visiting the bridges on weekend days is a relaxing and cheap form of entertainment. 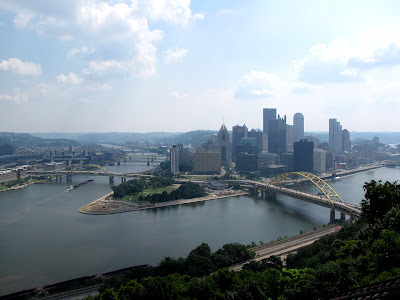 After we completed our bridge tour and planted a letterbox in Pittsburgh, we moseyed down to West Virginia, where we thought we'd find some relief from the heat. We did not.